J.Crew is far too big and far too preppy to actually endorse a candidate, and that's probably for the best—do mall retailers really need to get involved in politics? One thing they've wholeheartedly embraced, though, is the all-yellow outfit Michelle Obama wore on Jay Leno last week. 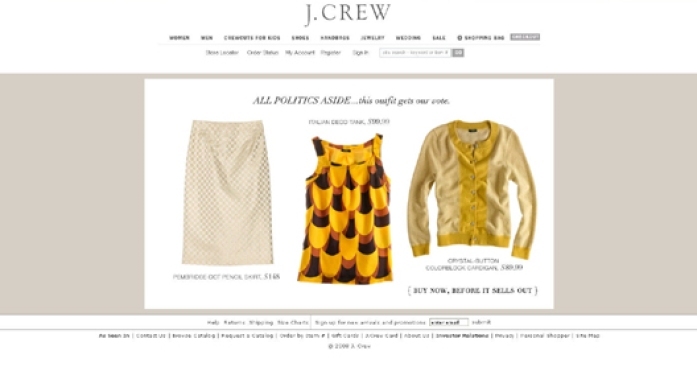 Here's what the J.Crew homepage looked like earlier this morning. "All politics aside," it says, "this outfit gets our vote." If Obama wins, will the cardigan sell out of stores?